What's your volleyball/Sports playing experience? I have been active in playing indoor co-ed and 2-on-2 grass volleyball for several decades. I am from the ancient times - before high schools in Northern Cal even had men's volleyball leagues. 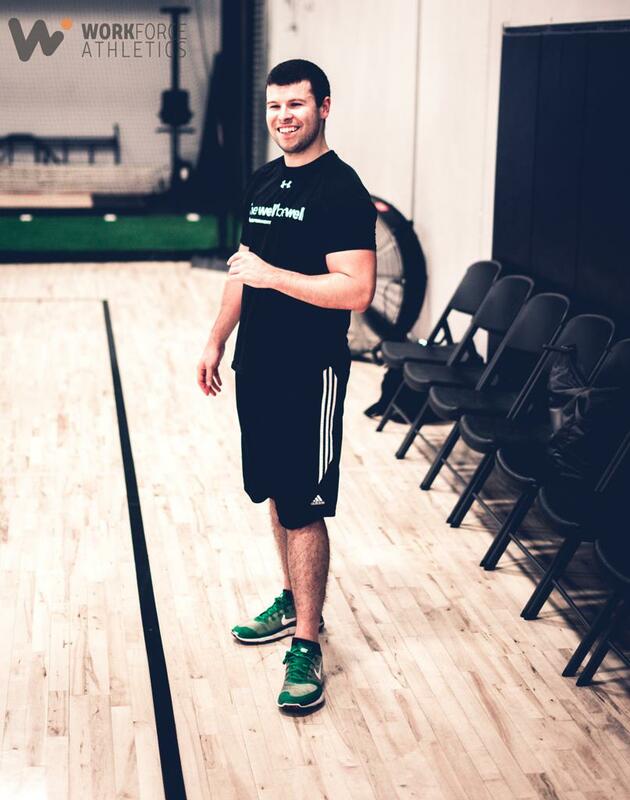 I started in high school PE class and later played in co-ed leagues in college and thereafter. My sister was the athlete in my family and she taught me the "knuckleball" serve. Thanks Rosemary! 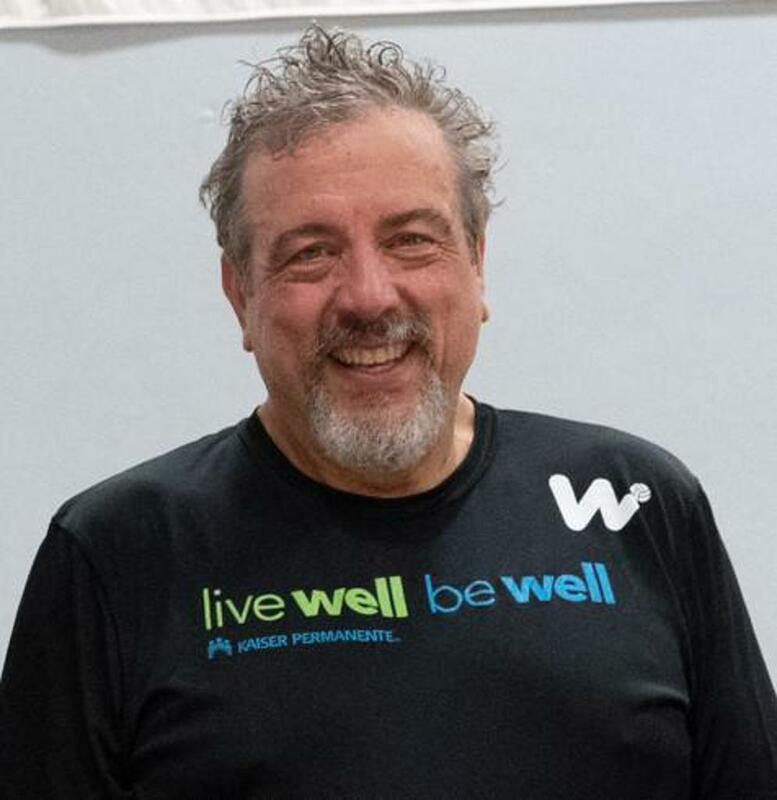 After losing 80 pounds from a diet last year, I felt my strength come back which allowed me to get back into volleyball. Having WFA work with businesses is a great way to help employees get more active, happy and healthy. My sister and Karch Kiraly. What's the best lesson you have learned from sports? Teamwork, never give up, and have fun in life. Oh yeah, and wear your knee pads if you do not like knee raspberries! I have taken chef training classes at UCLA (in Pacific Palisades) and Sonoma. As a pharmacist, I follow recipes really well. My previous volleyball experience was high school and some local recreational leagues. I first played volleyball in middle school approximately 43 years ago. WFA offered me an opportunity to play with a team who have the same goals of just having fun. I am inspired by many people but currently Ruth Bader Ginsberg is really inspiring me. The lesson I learned from sports was always try your hardest, play well with others, and have fun whether you win or lose. One fun fact about me is that I used to fight in tournament Karate. 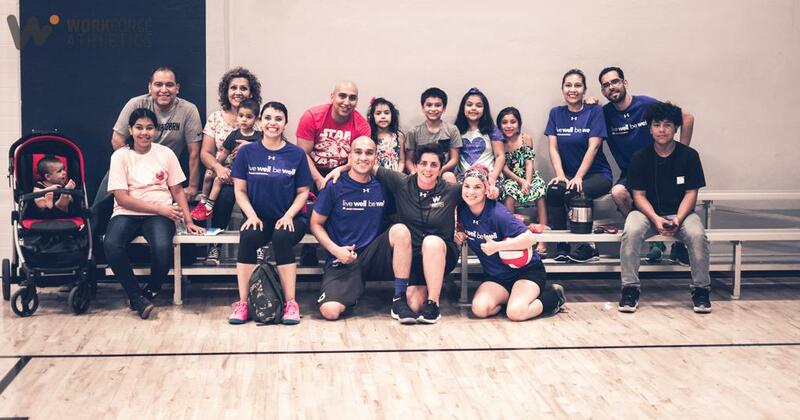 *Omar is front and center with WFA Founder Sheena Lister and the extended Loera family. My volleyball experience is very minimal, only time I played it was at family reunions at the park. I never played organized volleyball until now, with WFA. I played baseball and football as a little kid and high school soccer for 3 years. I choose WFA for my team sports because they make it as real as possible. We have coaches! It is well organized AND getting better. I play in a lot of basketball leagues and I can honestly say, WFA is one of the better ones. The person that really inspires me is my younger brother, Juan Loera (pictured at left behind Omar in red shirt). We are both alike and love to play sports. He pushes me to play better and harder as I do to him as well. The best lesson that I have learned from playing sports is that, IT'S A TEAM game. You get more from players by talking them up, hyping the team up, then talking down to them. One fun fact about me is that everyone who knows me, knows that I love to play basketball. What people don't know is that my younger brother is the one that actually taught me the game! I didn't really start playing like I do now until I was in my early 20's. Now, the student (me), became the teacher! I have always loved playing sports. It's exhilarating and fun to get active by yourself and with others. 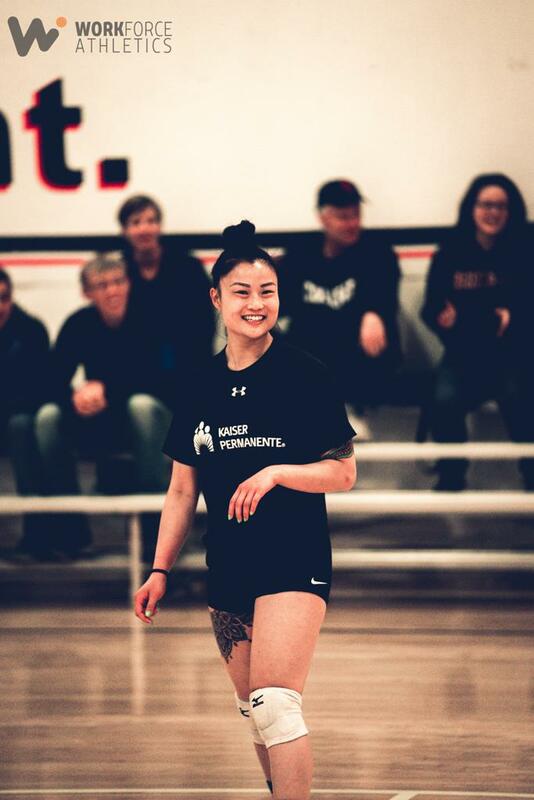 I only played volleyball while I was in middle school, but I was always interested in the sport because my sister also played from elementary to college as well as with club teams. I started playing volleyball in sixth grade. All my friends played it, so I thought, "Why not, let's try it." I started playing with WFA since last year 2018 while they were first piloting the volleyball league. I thought it was admirable for WFA to create a safe and competitive space for everyone to play recreationally and get active. My sister inspires me with her willingness to compete in sports while still studying and building her career. My husband inspires me with his support and love with everything he does. My mother also inspires me for always being strong and independent. Lastly, my teammates inspire me to be the best competitor I can be. Sports are fun to play, but the bond that you develop with everyone around you is what makes playing the sport even better. Jaime- All of my sport playing experience was in high school. I played football, soccer, and basketball all four years of high school playing quarterback, midfield, and small forward, respectively. I actually never played organized volleyball, rather just pick up games through high school. Kimmy- I've been playing a wide variety of sports since I was a little girl and have always wanted to play volleyball. It wasn't until high school that I finally got to play and I have loved it ever since! Jaime- Started playing volleyball in high school but not on a team. Mainly, I played and practiced volleyball because my wife was a volleyball player and pretty good one too! 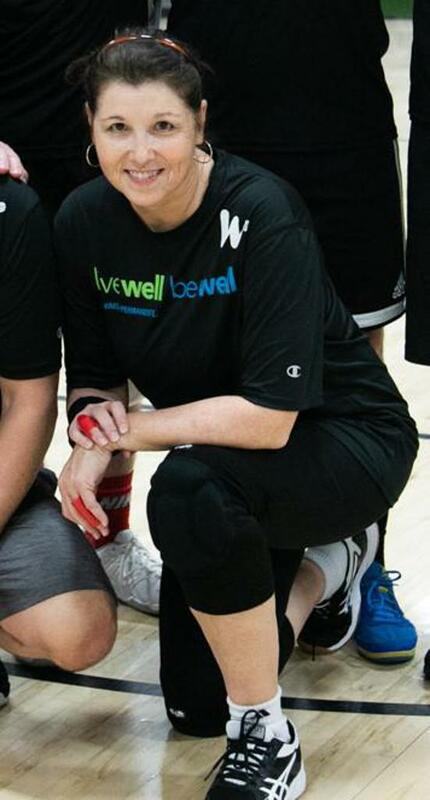 Kimmy- I started playing volleyball (and basketball, softball, and soccer) in high school. Jaime- I choose Workforce Athletics at first because our organization (Kaiser Permanente) put teams together via this company. With that being said, this is my third time around in WFA sport teams and I think the coaches are great, the organization and scheduling of the games is clear with the use of the Sports Engine app, and mostly I feel like you get the most for your time and money in the way WFA can pack a game into an hour. Kimmy- I was so excited when I found out that Kaiser was partnering with WFA and had sign-ups for volleyball and basketball! Me and my husband have been looking into local sport teams that we could join after work or on weekends. We love WFA because it gives us an opportunity to play all the sports we love together. Jaime- My wife who plays on the WFA teams I am on. She inspires me everyday in my life both personally and professionally. She has a drive and the determination to give your best in everything you do and that has rubbed off on me as well. She's also competitive and loves to play sports. Kimmy- My grandparents are my biggest inspiration. They came to the United States from Thailand with on $600 in their pocket. Through hard word and determination, they were able to start a restaurant business, purchase their first home, support the family, and provided for me throughout my entire childhood. I certainly would not be where I am today without their love and support. Jaime- The best lesson I have learned from sports is the value of effective communication and how that translates to an effective and cohesive team. 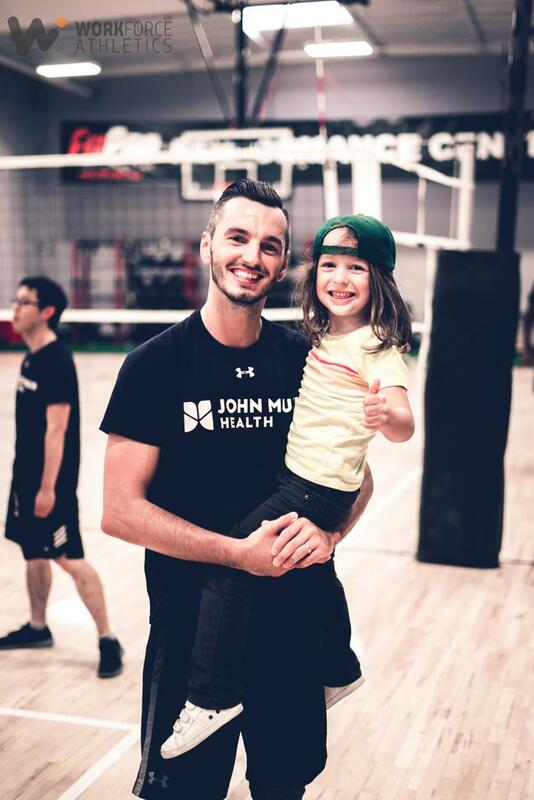 I feel like my sports playing experience not only has benefited my health and physical well-being, but I feel like it teaches you lessons on how to build strong relationships and effective communication practices that translate to the professional world. Jaime- I love to go wine tasting. I played Varsity volleyball in high school during my Freshman year. Since then, I have only played recreationally, and this is now my second season playing volleyball for John Muir WFA. I started playing volleyball when I was a Freshman in high school. This is my second year playing both volleyball and basketball for John Muir WFA. I enjoyed playing competitive sports and signed up as soon as I heard about it. It's not easy to coordinate organized sports with a busy schedule and I'm grateful that WFA can provide that for us. I have met some great people through these leagues and always have a great time. My family is what inspires me. My wife and my kids come to all of my volleyball and basketball games and I love having them there to cheer me on. Sports have provided me with the opportunity to develop discipline, communication, and teamwork, which then benefit me in other areas of my life as well. One fun fact about me is that I am from Serbia and I moved to the United States when I was 12 years old. I can speak Serbian and English fluently. I grew up playing pretty much all sports in high school: basketball, soccer, and track. 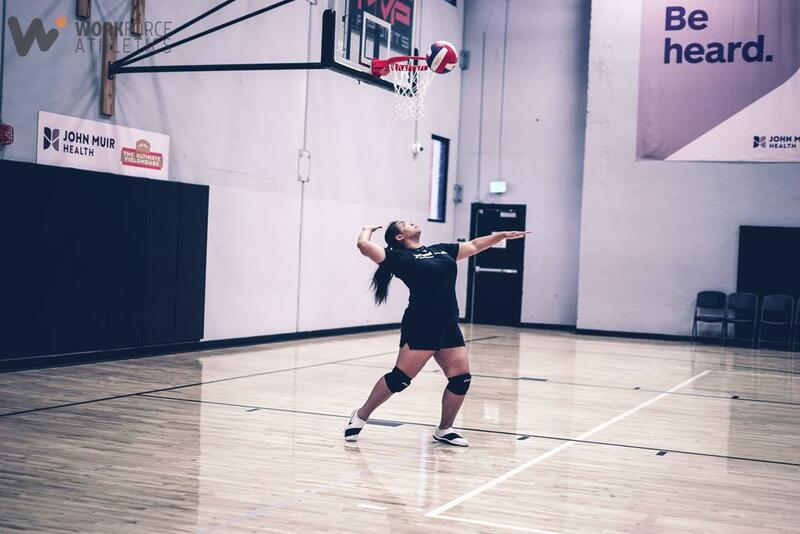 I was only introduced to Volleyball my senior year and (sadly) didn't really play again until WFA's summer league last year. High school was my first exposure to it, but I only recently started getting back into it this past summer. I still have a lot of learning to do, but hey - now I know what a 6-2 formation is! WFA brings back the spirit that made me fall in love with sports. 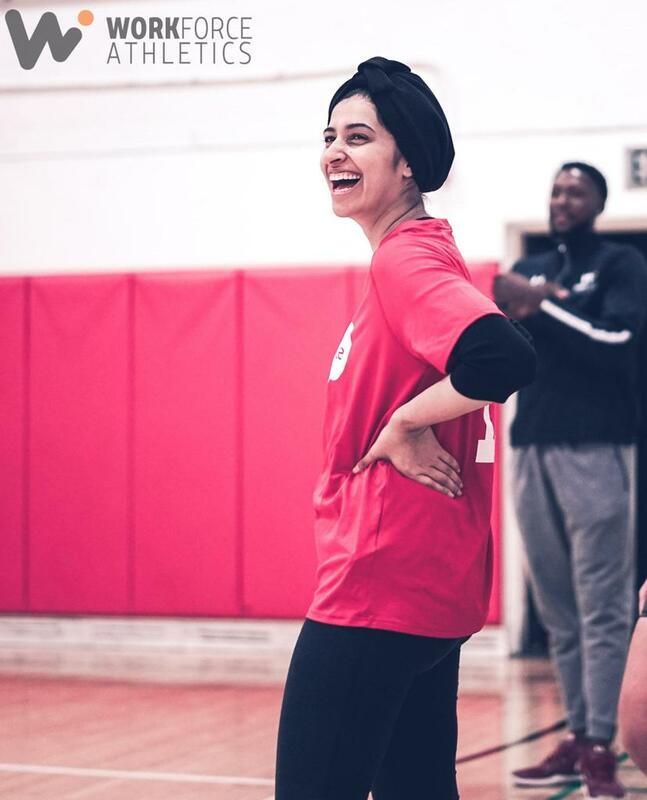 Having very little experience with volleyball, I was always timid about joining any leagues; WFA created a welcoming and fun space for folks of all backgrounds to come and play. It's what I missed most about playing team sports, and I love that I have a chance to get to know my coworkers in a different setting throughout the season. My family. They're the most easy-going, jovial people you could meet. Everything I've learned about respect for others and having a positive outlook in life is a result of watching how they interact with the world. They're also very competitive and take family board games nights to a whole other level. There's always room for improvement. It's very humbling playing sports with others because you get to see the skill and talent that others bring to the table. I've learned that improvement only comes with dedication and commitment, and I try to apply that practice to all aspects of my life. I grew up on a tiny island (the size of San Francisco) called Bahrain. Running a marathon means pretty much running the whole length of it.